UTV news presenter and journalist, Paul Clark. UUP MLA Doug Beattie has voiced support for UTV’s Paul Clark after the presenter faced Sinn Fein criticism over a news feature on the Royal Irish Regiment in Afghanistan. The television anchorman came under fire from Niall O Donnghaile on Tuesday after posting a Twitter message referring to the troops of the British Army regiment as “ours”. 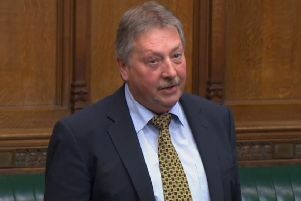 Mr O Donnghaile, a member of the Irish Senate and former Lord Mayor of Belfast, took issue with the description and sparked a public spat with fellow Irish-speaker Clark – calling on the television anchor to amend his phraseology in future. “Paul ain’t speaking for me and many, many other UTV viewers when he uses the term ‘our’.” he said. The Sinn Fein senator’s intervention provoked Clark to respond: “Is mise Gaeilge fosta” (I’m Irish too). The exchanges between the presenter and the Sinn Fein representative ended amicably with the UTV man offering to buy the senator a cup of tea the next time they meet at the Senate.